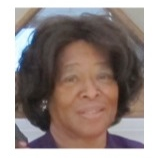 Dorothy L. Riggans is a graduate of Harlem Hospital School of Nursing and holds a Bachelor of Science degree in Human Resource Management from Upsala College. She has worked as Head Nurse and Director of Quality Management at the United Hospitals Medical Center. She was also the director of Catastrophic Case Management for Medicaid and Medicare of the City of New York, where she managed all transplants and high-risk cases. For community involvement, she is a member of the Black Concerned Nurses of Newark, Inc., President of the Board of Managers and President of the Foundation at the Church at Crossroads of East Orange, New jersey.